The classic holiday movie White Christmas comes to the stage in a new musical complete with all of the classic Berlin hits like “Blue Skies,” “How Deep is the Ocean?” and, of course, the unforgettable title song. Irving Berlin’s White Christmas tells the story of two buddies putting on a show in a magical Vermont inn and finding their perfect mates in the process. Full of dancing, laughter, and some of the greatest songs ever written, Irving Berlin’s White Christmas promises a merry and bright theatrical experience for the whole family. James Clow takes on the lead role of Bob Wallace (made popular in the film by the one and only Bing Crosby). Stepping into an iconic role and a story that has become a part of countless family traditions can’t be easy, but Clow brings a sense of wonderment to his role and is delighted by the role. What make seeing this show live so much more special than popping in a DVD? JC: I love seeing movies, but that being said, there is nothing like live theater. It’s one of the art forms where the audience is participating in the whole experience. A movie can be seen again and again—live theater is different every time and that holds a kind of magic. Watching White Christmas is a family tradition for so many; how do you see families enjoying the live show this holiday season? Something happens at the end of the show where children completely light up and it is amazing to see- whether you’re a family member or an actor onstage during the curtain call. With such iconic choreography and visuals, what was your experience adapting it for the stage? Any challenges? Triumphs? Randy Skinner’s choreography is phenomenal. Sheer joy! I think challenges are inherent when you compare a movie to theater as they are two different mediums. For me, the challenge is to drive the plot while maintaining a Bing Crosby-like cool. I find triumphs large and small throughout the course of the musical, both the character’s triumphs and my own personal ones. My goal is to do complicated things in a seamless and breezy way. James Clow and the touring cast of Irving Berlin’s White Christmas. 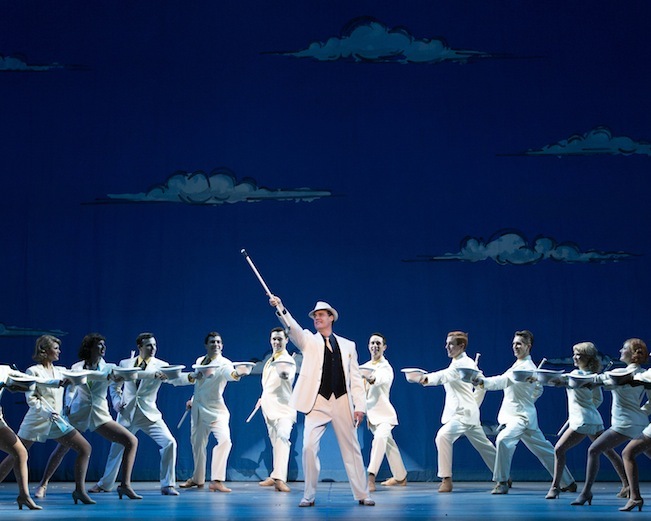 The stage production features the same classic tunes that everyone is familiar with. Do you find audiences start singing along and join in the show? At the end of the show, the audience is invited to sing and that’s a pretty cool sight. Generations singing a classic holiday song together! Would you say this show appeals to audiences’ sense of nostalgia? What about for first-time viewers: can they make new memories and traditions? 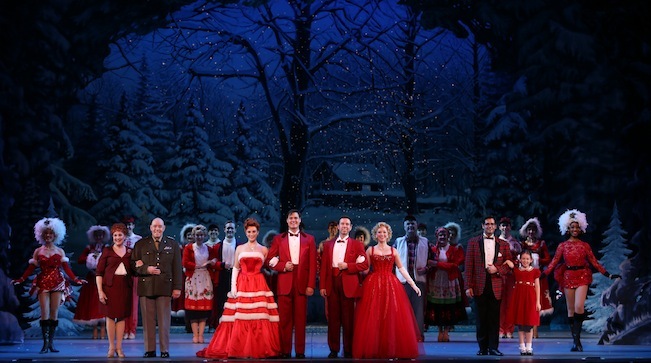 Irving Berlin’s White Christmas definitely is nostalgic, especially for older generations who actually served in WWII or their children who heard stories about it. It takes place before cell phones and the internet, a time where people’s generosity of spirit was profound. People helped each other and the “helping” seemed to be a reward in and of itself. All generations seem to get something out of the show; joyous tap dancing, Irving Berlin’s classic American songbook, and a heartwarming story not to mention snow. Actual Snow! Irving Berlin’s White Christmas runs at the Orpheum Theatre November 25 – November 30. For more information and to purchase tickets, head to www.hennepintheatretrust.org.